Want to play music wirelessly through your favorite speakers? The Peachtree BT1 is made to complement the Peachtree novaSE series of integrated amplifiers, but connects to any receiver, speaker, or amp that has a minijack, stereo RCA, or optical digital input. From there you can stream music wirelessly from your Bluetooth-enabled phone, tablet, or computer. The BT1 features aptX® audio coding for CD-quality streaming with compatible devices, as well as a built-in Wolfson® digital-to-analog converter (DAC) for clear sound when using the analog output. Easy connect, works well as long as I do not move the phone around away from the reciever area. Great service from Cruchfield. Would I be able to put this into the tuner input in my receiver? The aux and cd inputs are already being used. Add-On Bluetooth Music Receiver: The Peachtree BT1 add-on Bluetooth music receiver enables wireless connection of your Bluetooth-enabled devices (such as your Apple iPod/iPhone/iPad, Android smartphone/tablet, Blackberry, Windows PC, Mac computer, etc.) to your home entertainment system. Now, you will be able to listen to music files and music apps from your Bluetooth-enabled devices on your home stereo system (your home system must have a free stereo minijack, stereo RCA, or optical input). Bluetooth A2DP Technology: The Peachtree BT1 add-on Bluetooth music receiver features Bluetooth A2DP technology, which allows you to wirelessly stream audio (included stored music and music apps) from your Bluetooth-enabled device to your home entertainment system. You will continue to control your music and view song/artist information from your Bluetooth-enabled device. 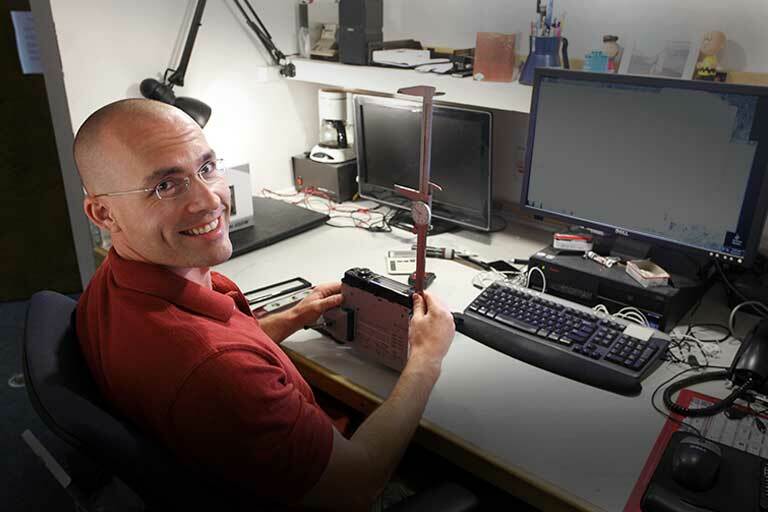 Up to 8 devices can be paired to the BT1 (only one device can be used at a time). 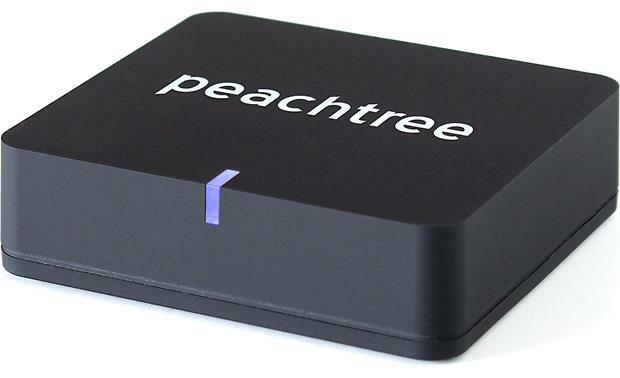 Note: Due to the differences in Bluetooth technology, some Bluetooth enabled devices may be incompatible, function improperly, or may not support all features when used with the Peachtree BT1 add-on Bluetooth music receiver . 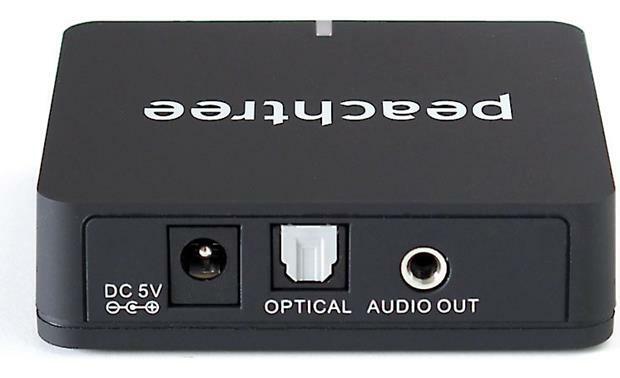 aptX Compatible: The Peachtree BT1 add-on Bluetooth music receiver supports aptX audio coding, which is featured on a growing number of Android mobile devices as well as MacBooks and Apple desktop computers. aptX allows audio to be broadcast wirelessly in significantly higher quality than over standard Bluetooth. The aptX codec achieves a 4:1 compression ratio, allowing for near-CD quality listening (16-bit/44.1kHz). You'll instantly notice more extensive dynamic range, deeper bass, and crystal-clear top end. Wolfson DAC: Unlike typical Bluetooth receivers, the BT1 uses a pure digital signal path and high-quality internal components such as a Wolfson DAC and a dual stage power supply to achieve the cleanest sound possible from Bluetooth. Analog & Digital Outputs: The Peachtree BT1 is fitted with both a stereo minijack (3.5mm) analog output and a optical (toslink) digital output to connect to your home AV receiver or integrated amplifier. A stereo 3.5mm-to-RCA adapter is included for audio components with a stereo RCA input. Flexible Placement: The BT1 Bluetooth receiver provides an advantage over having Bluetooth built into your primary audio component. Because it's an add-on device you can easily position the BT1 for optimum wireless reception. If your audio equipment is hidden away inside a cabinet behind doors you can place the BT1 out in the open for maximum wireless range. LED Indicator: The BT1 Bluetooth receiver features a single LED to indicate operation status. Power Requirements: The Peachtree BT1 add-on Bluetooth music receiver operates off of standard household current using the included external AC power supply or can be powered from a 5V USB port on back of your home receiver (USB-to-DC cable included). It should work fine. The only input you wouldn't be able to use is a phono input. Tape inputs would also work, or use a toslink/optical cable if your amp has digital inputs. Yes- the tuner, like the CD and AUX inputs are line-level, and the EQ curve is the same. My BT receiver is plugged into a separate amplifier, but I think any input would work. This can go into any input on the receiver. Those labeled inputs are not item specific; they are labeled for your convenience. Can I connect this device to my my television so that I can listen to my television and not bother anyone else in the same who doesn't want to watch or hear my television? It doesn't work very well. I don't even use mine. I regret buying it. Can you control volume from your iPhone with this device? Yes you can, both the TosLink digital output or the 3.5 mini-plug allow you to adjust the volume directly from your device. You will however have to find a good intermediary volume setting on your pre-amp so that you have a comfortable volume range when adjusting from your device. I have a Galaxy and I have full control over the music being played - I can shuffle, skip, replay songs, and I can adjust the volume being sent to the receiver/speakers. The device is merely a go-between. You cannot control the receiver.speakers with your phone. BTW,I have used this device for months without any problem. An excellent purchase and no regrets. I returned it so I can't be sure. I had connectivity issues. Went with audioengine Bluetooth device -- nearly 2X as expensive but well worth it for the sound quality and range of operation. Iphone streams to peachtree music server which in turn is connect to your amp or powered speakers & you control thru your amp remote or powered speakers ..so the answer is NO. I use my Kindle, not an iPhone, and have no trouble adjustng the volume. Yes, you can control the volume with your phone. I generally turn my phone media volume to max and use my audio system volume control, though. I'm not sure of the specifics of the martin logan soundbar, but this bluetooth device has two separate outputs: digital and analog. So long as the soundbar can receive one or both of these inputs (the images of the soundbar suggest it can), you would be able to stream from your iPhone to the soundbar. Yes, the BT1 has an optical output and the Martin Logan soundbars appear to have an optical input. Should be quite easy! Hi All, How do you stream it from your iPone / iPad. Say I am listening to TuneIn Radio. Does the AirPlay icon pop up automatically in TuneIn Radio ? Thanks! I am sorry that I don't know since I am using all Android products to interface. If my experience is any indicator, I'd expect that it will be pretty seamless with the Apple products. This device is Bluetooth (basic and APT-X). Simply have your iPhone or other Bluetooth-capable device link to it in the device's settings. I have the BT1 connected to the DAC in the PT Nova 125 integrated amp.